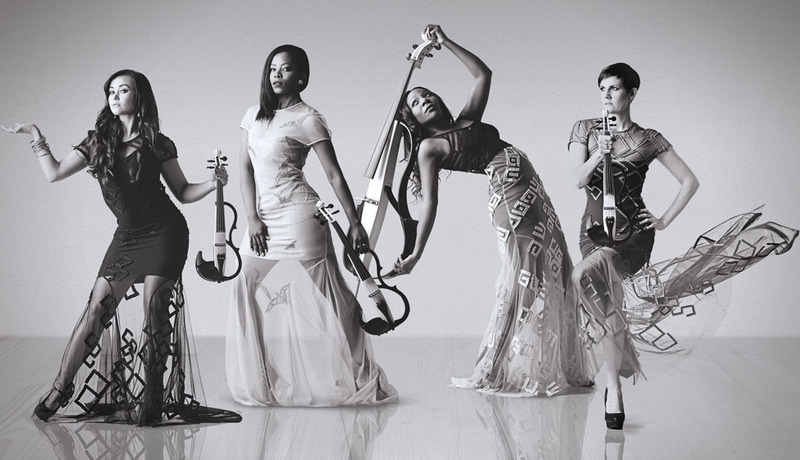 The Muses are an electric string quartet based in Johannesburg with a love and passion for entertaining. If there is a party worth starting, the best ignition mechanism is this funky four-piece out of Gauteng that will take any sensible situation and turn it into a sensational night to remember, two violins, one viola and a single cello at a time. Meet four drop-dead gorgeous, classically-trained virtuosos, all keen to get as many people on their feet and dancing the night away each time they unpack the contents of their two carefully considered albums.. The chemistry that makes The Muses spark comes from many different places. “Ruby is the rock chick and a big John Mayer fan”, Kotze explains. “Mia’s world revolves around music, she loves anything new and fresh on the market and with a busy teaching schedule there’s never a quiet moment in her life. Laetitia, or “baby-muse”, is busy studying music at the University of Pretoria, so there’s lots of classical influence in her life. I’m more of an indie and world-music lover, my all-time favourite artist is Cesária Évora.”. In Greek Mythology the Muses were the goddesses who inspired the creation of literature and the arts and together they played, sang and danced while inspiring others to do the same. Think evergreen classics sitting comfortably alongside the likes of David Guetta’s “Titanium”, Bruno Mars’ “Locked Out Of Heaven” and P¡ink’s “Try”, and what’s patently clear is these opening monster hits hug as they tease all that’s good in pop, while embellishing further with lush string arrangements. Following on the phenomenal success of their debut, The Muses have been adding beautiful music to their repertoire and sharing it at their high profile events, including The Spring Summer Guess Fashion Show, the launch of the new BMW 6-Series, the 2013 UEFA Champions League Heineken Mansion series, as well Mercedes Benz’ G-Class launch in Namibia. “An extraordinary venue,” Olivia recalls with a smile. “It was our first cave performance, but we’re hoping to play as interesting and original venues as we have clients who love what we do.” The Muses make the rooms they play in, and with each the quartet blazes a trail and reputation that’ll see these four busy, playing up a storm indefinitely!